In this and the next article I will discuss some of the politically contentious issues surrounding what some of us call “illegal immigration,” with reference to the works of three anthropologists—Andrew Kipnis, Nicholas De Genova, and Luis F.B. Plascencia—and the commentaries they sometimes make of each other’s arguments. This is a promised continuation from two earlier articles dealing with immigration and capital, and citizenship (in the context of resource nationalism), where I mentioned in the latter piece that Andrew Kipnis, an Australian anthropologist, had advanced an argument for what might be called global or open citizenship. That is the focus of this article; the next one focuses on the debate among US anthropologists about classifying people as either “illegal immigrants” versus “undocumented migrants”. Kipnis (2004) makes an argument for removing barriers to immigration, writing in the Australian context where successive governments have taken a particularly hard line with those seeking asylum, interring them in camps in the outback or on nearby Pacific islands. Where and when it is expressed, anti-immigration sentiment can be exceedingly sharp in Australia; I would argue that it far outdoes anything we have heard coming out of the recent elections in the US. So it’s not exactly an easy effort to sympathize with the target of Kipnis’ critique. Let’s look at some of the main features of Kipnis’ criticisms and plans for a solution. Andrew Kipnis argues for “increased democracy in the immigration realm” (2004, p. 267). He makes strong arguments in his article about the arbitrariness of the visa application process, the quick interviews and summary judgments rendered by complete strangers (consular bureaucrats), that make a mockery of first world governments’ incessant lecturing about democracy and human rights. Anyone who has experienced or witnessed the arbitrary wielding of visa power, would immediately embrace Kipnis’ argument. He goes further with his argument, placing democracy (democratization) in juxtaposition with globalization. The intention, which is a good one, is that all people whose lives are impacted by the policies of a particular state, should have a say in how that state manages its affairs and particularly how it manages its entry requirements. In the absence of such an arrangement, what prevails at the level of international relations is a type of tyranny. As Kipnis explains: “In a global frame, what can democracy mean when the ‘citizens’ of impoverished nations have no influence on the governmental policies that affect them most, in particular the immigration policies of wealthy nations?” (2004, p. 267). “Imagine,” Kipnis asks: “What, then, could a world with global citizenship or, more modestly, less restrictive immigration laws be like?” (2004, p. 270). He focuses in particular on what he sees as the problem of “denying the considerable economic benefits of first world citizenship for most of the world’s population” (2004, p. 270). Instead of foreign aid programs, citizens from nations previously receiving such aid should instead be allowed to migrate to the aid-donating country. So instead of the US sending development or humanitarian aid to, say, Ethiopia, it would instead issue an open invitation to Ethiopians to migrate to the US and take up US citizenship. It’s not “global citizenship” in the way some might understand it (as a “citizen of the world”); rather, it is specifically a call for an open borders policy among developed nations, that effectively entails a globalization of their own citizenship. Kipnis is aware that such a program would come with its costs. The costs would also not be equally incurred among citizens of the previously aid-donating nation. “I begin from the premise,” Kipnis writes, “that a more egalitarian immigration policy requires a willingness on the part of first world nations to tolerate a level of immigration that could lower current living standards. To the advantage of that nation’s wealthy and the disadvantage of its poor, wages, especially for unskilled jobs, might go down” (2004, p. 270). While wages, he maintains, would be depressed and heighten income inequality, that is not the only cost: “Schools, for many, could become more crowded. Tax burdens may rise, welfare benefits decrease, public parks and spaces become more crowded and shanty towns develop” (Kipnis, 2004, p. 270). “Undoubtedly, there are better and worse ways of sharing the costs, but,” Kipnis argues, “it seems unreasonably optimistic to assume either that first world citizens in general would not have to assume more costs than they do now or that relatively disadvantaged first world citizens would not, at least initially, be disproportionately threatened by the changes” (2004, p. 270). On the other hand, as wages, social services and the quality of public spaces decline in the host nation, the appeal to prospective immigrants would be diminished (or so he thinks), which would then deter future immigration. As Kipnis explains it himself: “A relatively open migration scheme would also increase the chances of those who do not find a reasonable level of comfort in their migrant destinations returning to their original homes” (2004, p. 271). In a reiteration of this argument, Kipnis states: “Even if open immigration regimes did lead to a decline in the difference between first and third world living standards, this in itself would lessen the incentives for labour migration” (2004, p. 271). It would not be much of an argument, and certainly not an appealing one, if Kipnis had restricted his comments only to the potential negative outcomes of openness. Thus he first tries to scale back some of the earlier speculation presented above. As he writes, “it seems overly pessimistic to assume that wealthy nations would simply be overrun”. “Many factors,” Kipnis argues, “would limit migration”. Migration, as he notes, “usually moves through specific networks or labour recruitment systems,” further observing that, “in all the migrations that have shaped the European continent…the percentage of population that migrates has never been very large in comparison to the total population of either the source or the destination country” (Kipnis, 2004, p. 270). In particular, the reality is that most people stay in the countries where they were born—a fact that is true, as the UN estimated, about the overwhelming majority of the earth’s inhabitants. According to the United Nations Department of Economic and Social Affairs, and the Organization for Economic Cooperation and Development, “compared to the global population, the number of international migrants remains relatively small. In 2013, international migrants comprised about 3.2% of the world population, compared to 2.9% in 1990” (OECD-UNDESA,2013, p. 2). A similar figure—3.3% or 244 million people—was reported by the United Nations Population Fund, as constituting the total world population of people living outside their country of origin. Thus Kipnis is right when he writes: “For most, leaving behind an established home and community to move to a foreign country is not worth the social costs of relocation and starting over. Migrant populations would likely continue to consist of a combination of the most desperate, the most ambitious and the best connected” (2004, p. 271). In fact, since so few people actually move, one wonders why there is an anthropology of “mobility,” and no anthropology of “stillness”. Some find it politically convenient to selectively appropriate the “facts” of emigration from a particular nation-state, which is taken to be representative of a socio-economic system, in order to indict that system. Notice, however, when the “voting with their feet” argument is not used. In the mainstream imperial discourse of the US, only dissatisfied Cubans “vote with their feet” and indict “communism”. What those from states allied to the US are indicting when they leave in massive numbers—Haitians, Hondurans, Puerto Ricans, among others—is never open to discussion. Though there may be some of the costs that Kipnis predicted in the previous section, he qualifies that by writing: “The effects of open immigration policies on the dynamics of economic exploitation are difficult to predict, though it seems likely that third world workers at least would benefit” (2004, p. 272). Adding to this, Kipnis’ arguments suggest that open migration policies could also undermine some of the most nefarious global enterprises, such as illegal human trafficking. We can infer this argument from the following passage: “As first world governments increase the level of violence towards asylum seekers, more and more of the would-be immigrants entrust their lives to people smugglers, whose exploitative practices are both encouraged and enabled by the cruelties of immigration law enforcement” (Kipnis, 2004, p. 269). In the absence of illegalized or criminalized migration, exploitative human traffickers would lose their reason for being as movement would now be legally free. Kipnis’ arguments cannot be easily dismissed on either analytical, political, or moral grounds. It is probably one of the more interesting and productive critiques of current immigration policies that one can read in any English-language anthropology journal, and as I indicated previously his article also makes crucial points about the problematic state of anthropological knowledge where citizenship is concerned. The next section, though designed to raise some doubts about his arguments, is not intended as a dismissal. One possible problem with Kipnis’ attempt at a solution is that it is not clear what is the intended target: is it the first world state? Is it the increasingly impoverished working class in the first world? Is it transnational corporations? Human traffickers? Or is it authoritarian systems that turn their countries into the sweatshops of the world? Is it the lack of real democracy at the international level? Is imperialism the target, for historically developing clear lines of difference in capital accumulation between centre and periphery? Or is globalization the target, because such clear lines of difference have shifted and become more ambiguous under the totalitarian reign of the transnational capitalist class? Without a clear statement about the nature and origin of the problem, it is difficult to arrive at a feasible solution—except by accident, perhaps. However, the fact that all of the above are implied targets of Kipnis’ critique, even if their interrelationships are not yet articulated, is itself productive. To keep on the track of a productive critique, there are certain pitfalls in Kipnis’ argument that I think should be avoided. One is to avoid setting up migration as a solution—by his own admission, Kipnis is aware that migration is partial and uneven (not everyone everywhere chooses or is able to migrate), and therefore it is at best an unequal means of wealth redistribution. It is also uneven and unequal because only some have the resources and contacts necessary to migrate. If immigration is a partial and therefore unequal means of global wealth redistribution, Kipnis also seems to assume that immigration produces greater benefits for the migrant than for those exploiting the migrant—in other words, his argument does not recognize how immigration, and especially an open borders policy, can sustain the dominant interests of capital. Kipnis’ plan runs up against the Trump solution: penalize those companies which move to exploit cheaper labour opportunities abroad, and incentivize those which move to come back. A second is to avoid arguments that suggest political change at home should be endlessly deferred, that in place of some form of local social transformation what should be sought after is movement abroad. Why? Because otherwise the argument becomes that the lack of democracy in some places is acceptable to “us,” but not in others. After all, why should “Third World workers” have any say over the government policies in “First World states,” if they do not seek to impose their will at home? And if they could make their lives better where they were born and raised, would they even care about some other country’s immigration policies? The third problem with Kipnis’ attempt at a solution is that it involves accelerating the exploitation of native-born workers in places such as the US, which feeds into the politics of replaceability that has been so roundly rejected (not yet defeated) in the US and the UK. Kipnis’ plan which knowingly transfers the costs of openness to the working class, which will inevitably heighten conflict, is not a workable one. How, in a supposedly democratic system—which he wants—would he sell such a plan to the working class? Moreover, while Kipnis is aware and honest about the fact that a lot may be lost socially and economically in societies such as the US and UK thanks to an open borders policy, he then seems to suggest that it is worth it just to offer this convenience for uncertain or undecided migrants who, faced with the consequences of a decline in social services in their new host nations, might then decide to return to their nations of origin. That is an awful lot of destructive chaos to entertain, just for the sake of an international game of musical chairs. Related to the third problem is the fact that Kipnis’ proposal could be read ironically as a means of indirectly deterring immigration, which is not that different then from the Australian aid argument with which he finds fault. Besides that, and to state his proposal in different words, his plan involves the potential equalization of global poverty among the working class, which also requires “First World” workers to meekly comply. Also related to the third problem is that Kipnis’ proposal focuses on “exit” only, and is not that concerned with what happens as a result of migrants’ move, that is, “entrance” to a place already populated with exploited workers. This strikes me as yet another searching for a “spatial fix” to the problems of capitalism, this time involving moving people like objects here and there. Fourth, and last for now, is that open borders do not quite terminate the jobs of human traffickers, as much as it simply institutionalizes the human trafficking. It would be a less risky, more regulated, probably state- and/or corporate-run traffic, but still: movement comes at a price, so some will still profit more than others in a capitalist world market. The persisting problem here lies with finding local/national solutions to problems engendered by global capitalism. It’s almost as if we are forced to await some “solution” offered by an event of cataclysmic proportions, such as a revolution in China that knocks out of order the factory to the world. Sidebar Text: Who is Coming to America? 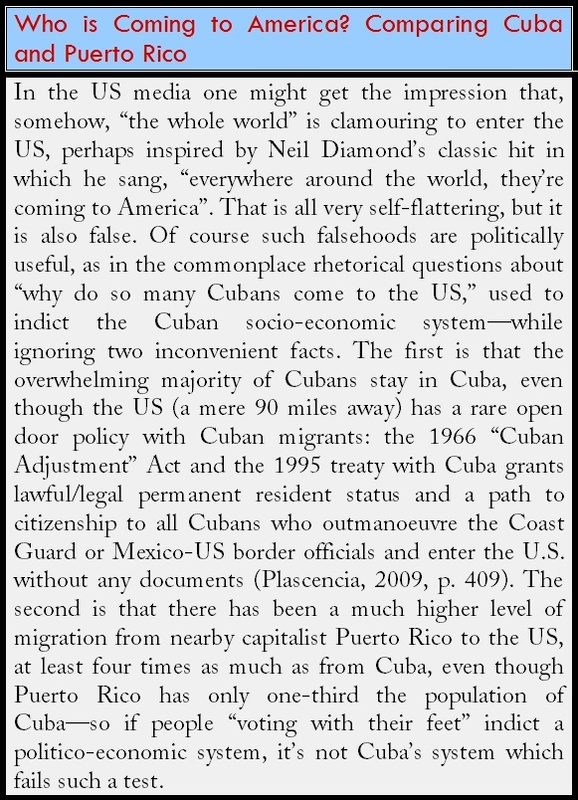 Comparing Cuba and Puerto Rico—In the US media one might get the impression that, somehow, “the whole world” is clamouring to enter the US, perhaps inspired by Neil Diamond’s classic hit in which he sang, “everywhere around the world, they’re coming to America”. That is all very self-flattering, but it is also false. Of course such falsehoods are politically useful, as in the commonplace rhetorical questions about “why do so many Cubans come to the US,” used to indict the Cuban socio-economic system—while ignoring two inconvenient facts. The first is that the overwhelming majority of Cubans stay in Cuba, even though the US (a mere 90 miles away) has a rare open door policy with Cuban migrants: the 1966 “Cuban Adjustment” Act and the 1995 treaty with Cuba grants lawful/legal permanent resident status and a path to citizenship to all Cubans who outmanoeuvre the Coast Guard or Mexico-US border officials and enter the U.S. without any documents (Plascencia, 2009, p. 409). The second is that there has been a much higher level of migration from nearby capitalist Puerto Rico to the US, at least four times as much as from Cuba, even though Puerto Rico has only one-third the population of Cuba—so if people “voting with their feet” indict a politico-economic system, it’s not Cuba’s system which fails such a test. De Genova, Nicholas P. (2002). “Migrant ‘Illegality’ and Deportability in Everyday Life”. Annual Review of Anthropology, 31, 419–447. OECD-UNDESA. (2013). World Migration in Figures. A joint contribution by UN-DESA and the OECD to the United Nations High-Level Dialogue on Migration and Development, 3-4 October 2013. Plascencia, Luis F.B. (2009). “The ‘Undocumented’ Mexican Migrant Question: Re-Examining the Framing of Law and Illegalization in the United States”. Urban Anthropology and Studies of Cultural Systems and World Economic Development, 38(2-4), 375–434. UNFPA. (2015). Migration—Overview. United Nations Population Fund. I think a big issue of immigration as a solution to problems of international development / inequality among nations / inequities of globalized business, is its flip side, the emigration. It is the “most valuable” citizens of any region that can most easily compete elsewhere, well enough to make up for the relationships broken by migrating. So the disadvantaged region is further depleted of its best citizens. This is true within a country as well as between countries. On the one hand, emigration of the “top” citizens opens opportunities for the others to move up. But if the magnitude of the drain is too big, it may end up unintentionally hurting everyone else left behind. What a pleasure to see intelligent, constructive discussion of a very human issue ! As a follow-up, zeroanth fans may care to read A Seventh Man, by the great John Berger, an inspiring humanist who wrote about Europe’s migrants in the 1970’s. Not an academic study, but ,typical of his work , redolent with decency and wisdom. He expatriated himself to the French Alps for c. forty years, always spoke from the heart, and died in Paris on 2 January. The “massification” of the migration question is a dangerous path, as it risks diverting attention from individuals involved . In the case of North America, of course, uprootedness has long/always been a challenge to people, one to which they have not each and all responded with generosity of spirit. We see how, both in the US and Europe, demagogues feed on understandable concerns of the “natives” to , very often, exacerbate feelings – a wonderful diversion from the real task, that of nurturing solidarity among working people.